The S1U2001-MDSW “Pit Viper” is an ultra-rugged, 1U rack mount, lightweight multi-domain server system with up to 16 CPU cores, multi-port Ethernet switch, and removable drives. It is designed to provide two fully-independent and isolated high-performance servers, as well as a 14-port intelligent hardware switch/router sub-system supporting Layer 2/3 routing functions with customizable rules—all in a 1U high box. It provides the highest level of workstation performance possible in a fully ruggedized, convection-cooled system, operating from -20°C to +75°C. Even the AC or DC power supplies are separate to assure full isolation. This system architecture simplifies deployable MIL-SPEC technology by Multiple Independent Levels of Security (MILS), NSA Red/ Black network separation, or system redundancy, while integrating processing, storage and high speed I/O in a small, ultra-rugged 1U high rack-mount enclosure with the greatest possible performance per dollar and per watt. 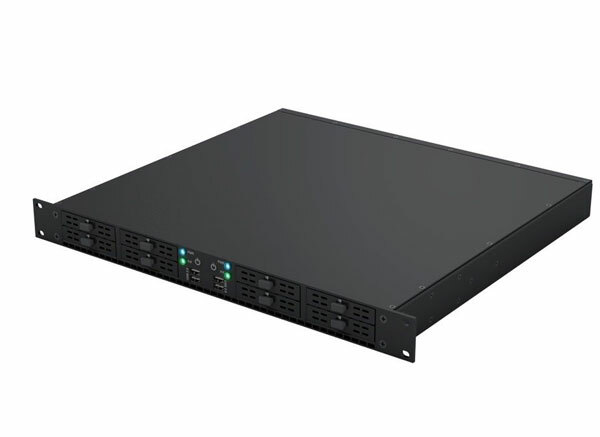 The 1U rack mount S1U2001-MDSW multi-domain Pit Viper is two complete 16-core Xeon® D server sub-systems each with an integrated intelligent Layer 2/3 Ethernet switch packaged together but electrically isolated, including their separate power supplies. Pit Viper is intended for military/defense/aerospace Red/Black networks—such as found on platforms with SIPR/NIPR networks. With the onboard 1 and 10 Gigabit Ethernet ports, Pit Viper is an ideal forwardly-deployed vehicle-mounted battlefield dual-server that offers double performance or redundancy due to the dual domains. Alternatively, the S1U2001-MDSW is an ideal airborne network multi-domain server that can also drive operator consoles, such as in an ELINT platform, while recording data and distributing it to multiple Ethernet LANs. The built-in switch provides wire speed local routing, bridging, and multi-node connectivity.